Do you have bikes you no longer need cluttering up your garage or basement? Bring them to West Windsor Farmers’ Market (Vaughn Drive parking lot, off Alexander Road) between 9 a.m. and 1 p.m. on Saturday, Sept 22 for the WWBPA’s bike drive to benefit the Boys and Girls Club of Trenton. 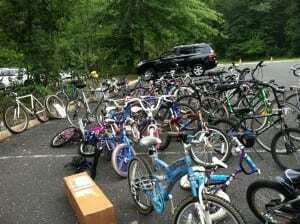 Bicycles of all sizes and condition are gratefully accepted, and donations are tax-deductible. Last year, we collected more than 50 bikes, and this year, we’re working to do even more. Bike Exchange also supports the WWBPA’s “learn to bike” classes by lending us a few bikes just in case a participant needs a slightly different size. Sometimes that makes all the difference! If you miss the bike drive, several area bike shops serve as drop-off sites. If you’re looking for a bike for your child that you know will be outgrown pretty quickly, this is a great place to consider. It’s also a great place to find authentic retro bikes, among other kinds, for adults. (It’s not a replacement for a bike shop, just a nice addition).